THE ÜBER PROJECT - Marco Beverage Systems Ltd.
We in Marco have been overwhelmed by the response to the Über Boiler. We showed the Über Boiler for the first time at CATEX, the national catering show in Ireland in February this year. With over 2,500 hits on James Hoffmann’s blog within 3 weeks of his post about the product and a significant amount of interest mailed directly to us at Marco, we decided to look at the future of the Über Boiler in a different way to standard product design programs. This is a new approach and it may well fail. I hope not, and with your input it won’t. Basically we want the tea and coffee community to become part of the design team! As the Über Boiler in its current guise is still really only at concept stage, it still has a design journey ahead of itself. It was designed as a once off to meet the needs of Square Mile Coffee as a custom solution to a custom need. I want to get the barista community and tea and coffee communities’ feedback on what they want in a product like this. Please let us know what you love, hate, would like, wouldn’t like in machine like this. I will be in Atlanta at the WBC in April this year with the Über Boiler in its next iteration. There will be two on show – It will be in both the Intelligentsia stand and at the WBC Coffee Booth. I would love to get industry comments on what you would like for your applications before Atlanta. We might include some things for the show. Come to the booths in Atlanta and have a play with the machine. Feedback after Atlanta will lead to the next iteration of the design. I will compile a surveymonkey link over the coming weeks to get your thoughts on some specific stuff. Huge thanks to David Walsh of the TheOtherBlackStuff.ie , the excellent Irish coffee blog. David is helping me out with the blog updates/interaction/twitter stuff as I’m a twitter virgin, not to mention with his coffee knowledge and coffee passion. What’s the Marco Über Boiler? The Über Boiler is a precise water delivery system designed to deliver exact volumes of water at exact temperatures to meet the needs of cup by cup tea infusion and coffee brewing. 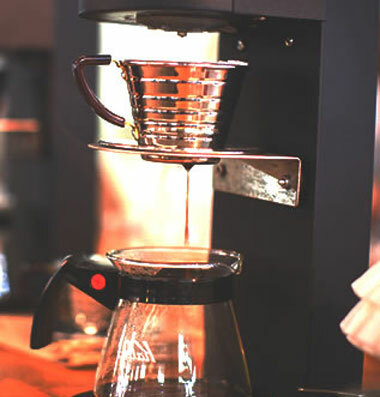 To brew coffee correctly, there are essential guides; in particular, you must have the right water to coffee ratio and the right brewing temperature. The Über Boiler gives the Barista control to manage these important parameters. It is and can be a lot more besides. Caffe Culture, London, May 2007. I was delivering a lecture on filter brewing excellence on behalf of the SCAE UK Chapter. Anette was running a cupping course in the same room after my talk, ably abetted by James. I had met James and Anette back in February 2005 where Anette was helping the SCAE Irish chapter as a judge and James was loitering with intent/lecturing on coffee/also judging (delete as appropriate). We have been in sporadic communication since then, mostly with James and Anette helping us out in Marco on training, judging and the like. We were cleaning the room after the cupping/filter coffee lecture and James was venting his spleen on the inability to get the control he desired on a hot water delivery system. Could I help? We thrashed it out and basically agreed I would have it designed in Marco. I visited Anette, Stephen and James last year (world Champions all) and put a more concrete spec together…. and off she flew! There are a few reasons why I chose to do this project. Firstly, it piqued my interest on a personal level. My background is in Industrial Design and this has firmly become a pet project of mine. Secondly, I knew the technology used in our commercial range of water boilers was not a million miles away from delivering what James ultimately wanted. Finally, it was an opportunity to challenge our Engineering team with a conundrum I knew they would all relish. I would be lying if I said the commercial animal in me didn’t see an opportunity to work closely with three the world’s finest and creative coffee people to deliver something unique. Oh, and I knew it would give me an opportunity to taste some of the finest coffees available for free! I’ll post something later about the journey from specification to first concept machine.